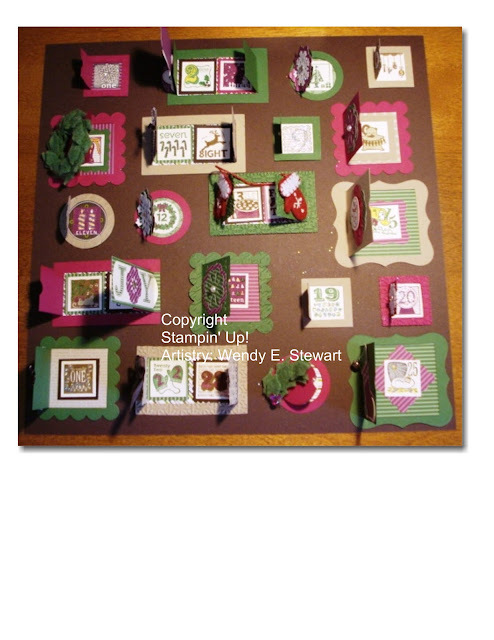 This project is a fun one that may work well with the assistance of your children. Using the Peekaboo Frames Bigz L Die, cut out 6 sets of frames in 3 colours, to coordinate with your choice of Designer Series Papers or Simply Scrappin' Kits. Use your bone folder to crease the windows open, then close them again. Stamp all the images from the 25 & Counting stamp set in coordinating inks. I used the same colours as my cardstock. Lay out the frames on the 12" x 12" background cardstock. I found that the double door frame held 2 of the 1" x 1" stamped images, so this allowed for 5 "days" for each row. Using the 1" punch, punch out all the stamped images. A great way to matte the 1" images is to use the Postage Stamp punch! I coloured some of the images, dazzled them with Dazzling Diamond glitter and used various coordinating Designer Series papers in order to bring the images alive. Once you have all the images decorated the way you want them, you can begin to glue them all down. Glue the 1" images to the background papers/cardstock, then place them on the 12"x12" background, then cover them with the peekaboo frame. Once you have all in place and glued down, you can decorate the outside of the frames, as desired. Make sure that your decorations do not interfere with the door opening. Thanks for stopping by! 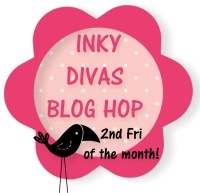 I hope you enjoyed this month's Blog Hop…make sure you check back in for our next one on November 11th where we will feature Christmas Cards! I've finally gotten back to what I love to do! Create ... share ... enjoy! I'm officially retired and have more time to spend on preparing my cards, especially preparing for Christmas. The blog content was prepared using My Digital Studio. Hope you like them! My new doctor is a lot stricter than the previous one. She recommended a loss of weight, reduction in salt and regular exercise. I'm all for that, if she is the one doing the lifestyle changes! So, I've gone on a low-carb diet, avoiding all "whites" except for cauliflower (now flour, sugar, salt, potatoes, rices, etc.). My acid reflux disappeared within a week! I've already lost 8.5 lbs in 3-1/2 weeks (mostly water retention, I'm told), and am continuing to progress. This site allows you to identify the food you eat in 1 day, to see if you are getting the balance you need. It looks at the inflammation factors of the food (good and bad) in order to reduce possible problems. Since I experience arthritis symptoms, by reducing the percentage of inflammatory foods I eat, I should find a reduction in pain. We'll see! It takes a lot more work to prepare special meals and a lunch every day, so I have less time to create cards, but I'm planning on a class in embossing techniques in the near future, incorporating ideas from the Emboss or Die CD from Technique Junkies which I received this week -- when my studio is painted. MDH is busy as we "speak", painting away! 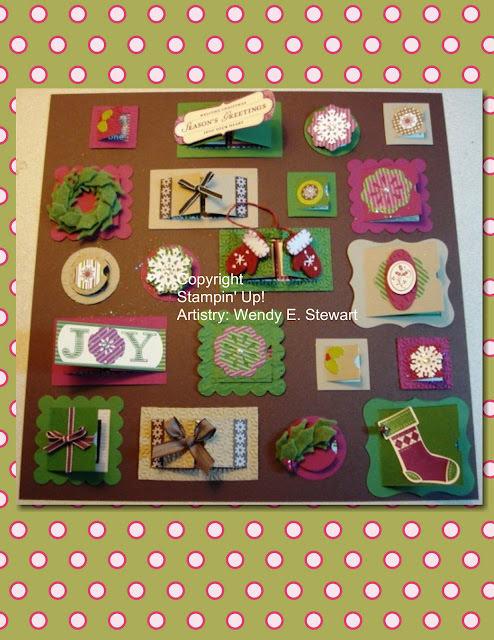 This card uses Stampin' Up!™;TM Wild Wasabi, Regal Rose, Pink Pirouette and Certainly Celery cardstock. 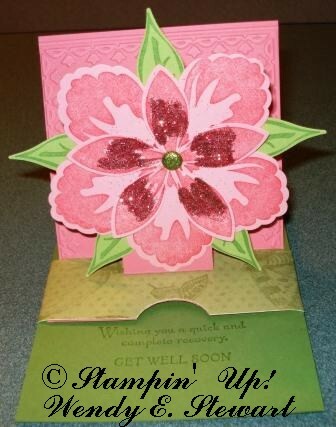 The flower is built from the Build a Blossom® stamp set and punched out using the Blossom Petals Punch®. The background card has been dry embossed using the Big Shot® with the Tulips Textured Impressions Embossing Folder®. The flower centre has been embellished with Pink Fine Supernova Glitter®. Instructions for the pop-up method can be found at SplitCoastStampers.com, called the Sliding Pop-up Card by Kim Score. Greeting is from the Thoughts & Prayers set. The Valentine's Day card is created using the LetterPress® Plate: Lots of Love®. It uses Pretty in Pink, Rose Red and Watercolor Paper (Vanilla). The pigment ink is Pretty in Pink and Rose Red. The grosgrain ribbon is threated through a Vanilla Hodgepodge buckle. The hearts are punched out using the Heart Small® and Heart to Heart Extra Large® (3 hearts) punches. You can't see the detail in the photo, but the debossed "Love" words cover the watercolor cardstock -- not just the words that were inked before putting the letterpress through the Big Shot®. 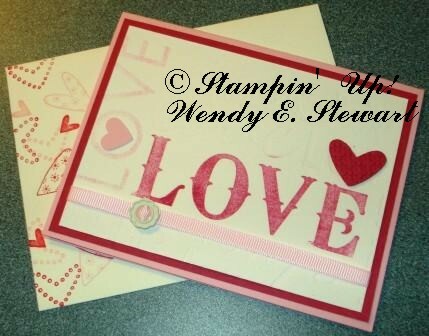 The heart over the "E" of Love (Rose Red) was also dry embossed using the Textured Impressions Square Lattice Embossing Folder®. 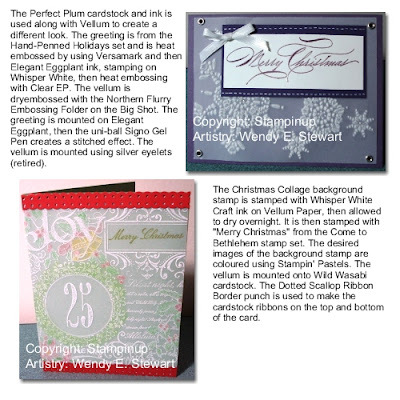 All products used can be purchased through Stampin' Up! 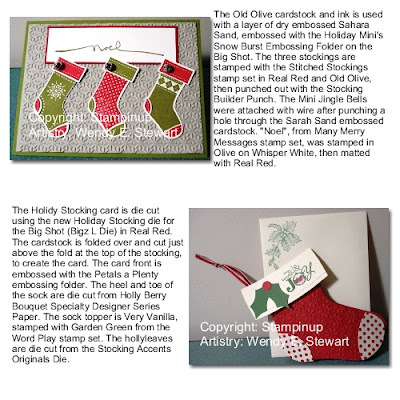 Call if you'd like to place an order or to learn more about how to create these lovely cards or to host a party to make special cards in your home with your friends or family. First card illustrated is a Side Step Card. I've provided 3 photos, so you understand how it looks, if you were here, in person. The hardest part is getting the folds correct! The rest is applying mattes and your images. The next card, to the right below (Owl) is a Pop-out Tunnel card. I've taught pop-out cards before and tunnel cards, but not combined, so this was new for me. What a great way to bring a surprise to someone! I thought this made a terrific birthday card. 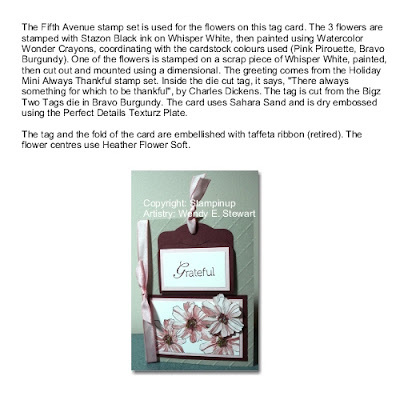 The front of the card was kept deceptively simple, to add to the surprise! I've provided a side view, so you can see the pop-out sizing. The Valentine's card is 4" x 4" square, so I had to throw in a designer paper envelope to match. This is a Box Corner card, so it folds out and stays open nicely, with a "floor" to the card that is decorated like the rest of the card. 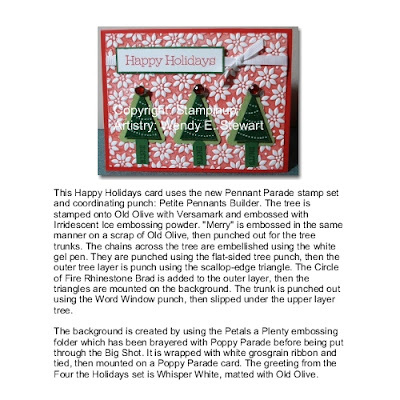 It I were to do this card again, and my class will find out on Saturday, I would not include the 2 inner pop-outs as it is too much. It the "Love" were a little smaller, it would work better. The next card is a French Door card, which is similar to a waterfall card. There are 2 waterfalls, though, which hide a greeting underneath. You pull out the 2 waterfalls by the ribbons to reveal the hidden message. This last card is a Kaleidoscope wedding card (to send as a guest/friend). Again, I've kept the outside very simple because there is so much on the inside. This is a card with layers of windows that add dimension. They are held together by brads through all the layers, which shouldn't show on the exterior of the card. I completed the card front before finishing the inside of the card -- a no-no in this particular card! I hope my guests enjoy the class on Saturday!!! There's still a few spots available, should you be able to come, but you need to let me know immediately! Preparation for this class takes a lot of time!